AUTO LABEL & RIBBON SILK SCREEN PRINTING MACHINE,T-Shirts/Towels Screen Press, Bottle Screen Press and Semi-Screen Printing Machines. Digital Color Label Printer LX400/LX810 There’s no need to settle for low-resolution color labels on your products. The LX400/LX810’s incredible 4800 dpi printing delivers results that far exceed virtually any other on-demand print method with bar code printing by ink cartridge available today. Auto Slitting,Counting,Inspecting,Rewinding Machine (Max WIDTH: 320mm and 410mm/Max speed: 70meter/min, Economical, High Efficient, Convenient to use, Winding Spindle Shafts: 25(1"), 38(1.5"), 50(2"), 75mm(3") available included Oprional Paper Core Cutter and Paper Shredder/We can change the color, specification & upgrade design of goods without notice) and Other Jumbo Slitting & Rewinding Machine. VARIOUS LABEL FOLDERS & CUTTERS Woven cutter, Ultrasonic Label Cutter, Belt Loop cutter, Webbing cutter, Round cutter, Printed Label Cutter, Cloth Cutter, Full Auto Seamless Glove Knitting machine& WOVEN REGAIN MACHINE. Paper Cups Forming Machines produces drinking cups for hot and cold liquids as well as ice cream cup, food service and other applications. 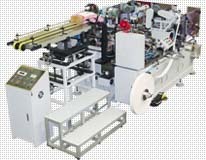 Rotogravure Printing Machine(4~9color) Laminating & Coating Machine, Extrusion Laminating Machine and etc machines. Flexo Rotary Printing Machine(250mm/330mm/430mm),In-line Fan Folding Machine,Squre Envelope Complete Making Machine, Envelope Pasting(Entrance-Glue) Machine with Excellent quality. Various Used Label Printing Machines(Flat-bed/Intermittent/Full Rotary/Semi Rotary and etc machines) With the ability to fully refurbish/recondition any machine to as new condition and guarantee quality, M-Tech can deliver the desired machine and re-install and commission in anywhere in the world.